New hedgehog babies are born at Millermeade Farms every week and other babies are available for purchase every week. We can almost always accommodate general baby requests with at least two weeks notice. Specific color requests are much harder to guarantee availability as it is often a “surprise” what colors will be produced. Our Premium Plan babies are the first available babies listed. These babies can be reserved or chosen up to several weeks before they are ready to go to their new homes. A hedgehog that is a little more shy or nervous than we like to see in our Premium Plan. We personally enjoy having a variety of colors in our herd and it has been challenging and fun for us to produce various colors. We do not however, enjoy trying to determine the true name of each color and trying to describe that color to others. One important fact to remember when choosing a color is that babies may change their color as they mature. This is especially true with the snowflake pattern and white varieties. 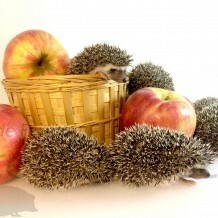 Hedgehog Central at www.hedgehogcentral.com has an amazing color guide. We are happy to accommodate broad requests such as standard or normal (shades of brown), something other than standard or something exclusive such as not albino. We almost always have both standard and fancy babies available. We hope that you will anticipate the surprise of the exact availability when you come. Customers who have a specific color request should look through our Placed in New Home page and give us an example or two of babies that look like the hedgehog you wish to purchase. “Split-face”, blaze mask, reverse pinto, black-eyed white, and white face standards are some popular colors that we often sell in advance through our Premium Plan. We are happy to look through our upcoming babies to see if we can determine if a potential color match is coming up in availability. We strongly discourage mixed genders to first time hedgehog owners. We suggest first time owners requesting two animals to choose two females. We do not sell Discount Plan babies in mixed genders.